Pro wrestler Chris Benoit had steroids and other drugs in his system when he killed his wife and young son last month and hanged himself in the family's home, investigators said Tuesday. Benoit's body contained 10 times the normal level of testosterone, which appeared to have been injected shortly before he died, as well as the anti-anxiety drug Xanax and the painkiller hydrocodone, authorities said. The Georgia Bureau of Investigation said Benoit tested negative for alcohol. The state's top medical examiner, Dr. Kris Sperry, said there was no evidence of any other anabolic steroids in the wrestler's body, and nothing to show that steroids played a role in the death of Nancy and Daniel Benoit. "An elevation of that ratio does not translate into something abnormal in a person's thought process or behavior," he said. Sperry said the boy appeared to have been sedated when he was asphyxiated, and Benoit's wife had a "therapeutic" level of sedatives in her body. Benoit killed his wife and 7-year-old son, placed Bibles next to their bodies and then hanged himself on the cable of a weight machine. Anabolic steroids were found in the home, raising questions about whether the drugs played a role in the killings. Some experts believe steroids can cause paranoia, depression and violent outbursts known as "roid rage." 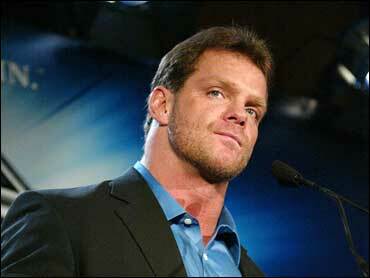 Benoit's wife, Nancy, tested positive for Xanax, hydrocodone and the painkiller hydromorphone. Daniel Benoit had Xanax in his system, authorities said. The GBI said it could not perform tests for steroids or human growth hormones on the boy because of a lack of urine. Federal authorities have charged Benoit's personal physician, Dr. Phil Astin, with improperly prescribing painkillers and other drugs to two patients other than Benoit. He has pleaded not guilty. Investigators have also raided Astin's office several times since the deaths, seizing prescription records and other documents. Before he was charged, Astin told the AP he prescribed testosterone for Benoit, a longtime friend, in the past. He would not say what, if any, medications he prescribed when Benoit visited his office June 22, the day authorities believe Benoit killed his wife.